It looks like a book--until you open the door that makes up the cover. Inside you have to flip it to the horizontal, because what you see is a laptop, a screen with three file icons (DOG, STUFF, DOG STUFF) on top and the familiar QWERTY keyboard at the bottom. Turn another "page" and you may find sheet music in the holder above a black and white piano keyboard. Another vertical page turn produces a refrigerator with the door wide open. One two-page spread only makes sense when you prop the open book, inverted V-style, and peer in to see that you're looking at is the inside of a pup tent. Another double spread opens up horizontally to form the inside of a tool kit. Some page turns let you look down at a scene--a tightrope walker bravely treading lightly over an abyss between buildings. 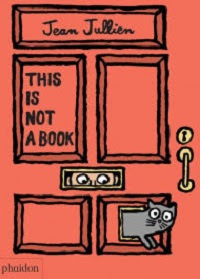 Illustrator Jean Jullien even packs a surprise inside a four-page gatefold, which opens into the room behind the door cover, with the other half of the cat exiting the cat door. Artist Jean Jullien's This Is Not A Book (Phaidon Press, 2016) is filled with different ways to look at familiar scenes, with a surprise with every page turn of this Not-A-Book that shows off the power of changing perspective in a sturdy board book format filled with funny details that will fascinate kids of all ages. Publishers Weekly calls this one "...a tour de force of visual transformation."